■ Jack Reynolds refuses to act his age. 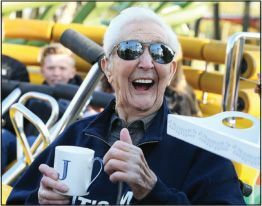 The great-grandfather from northern England celebrated his 105th birthday last week by becoming the world’s oldest person to ride a roller coaster. Wearing a sweatshirt emblazoned with the phrase “It’s my party and I’ll scream if I want t a tattoo.